On May 17 2016 members from three of our Queensland branches took part in the Queensland Legal Walk. The walk aimed to raise over $100,000 to support free legal services and pro bono work in Queensland. Over 1,000 lawyers from all over Queensland took part in the walk, including Shine’s Mackay, Townsville and Cairns branches. QPILCH, Queensland Public Interest Law Clearing House, organised the event - which is now in its 9th year. The funds generated by QPILCH, and events like these, help over 2,000 disadvantaged Queenslanders every year. 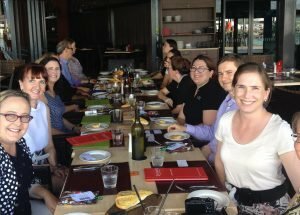 Staff from the Cairns branch were also invited to a National Volunteer Week lunch with Cairns Community Legal Centre. The centre provides free advice and assistance in over 100 pro bono cases each week, with many of the staff volunteering in their free time. To find out more about the Cairns Community Legal Centre or get involved with their work, see http://cclc.org.au. Written by Shine Lawyers on May 23, 2016. Last modified: September 6, 2018.